I may well be the female companion to the Geico Caveman. There’s a Rockwood gang Echo Park-adjacent? And, better yet, they have their own MySpace page?! Option no. 1. City officials, especially local police, are leery of Rockwood Park as a name, as it belongs to a local gang. The gang may demarcate/reclaim the park as their own, while rival gangs would have graffiti fun with the signage. The kind folks at the Bureau of Engineering would work repeatedly if it got tagged. Option no. 2. “Welcome” in both Spanish and Tagalog, is supported by the local neighborhood council. I’m taking a wild guess that a rep from the Greater Echo Park Elysian Neighborhood Council was in attendance. The translated “Welcome Welcome” Park, does not resonate with me, but the joint Hispanic-HiFi reference does. Option no. 3. A neighboring street bears the name Colton, so it is neither gang-related nor a non-double negative. Feedback from local citizens and those on an interested parties list are appreciated. Ultimately, the park’s namesake is in the hands of the Board of Commissioners. 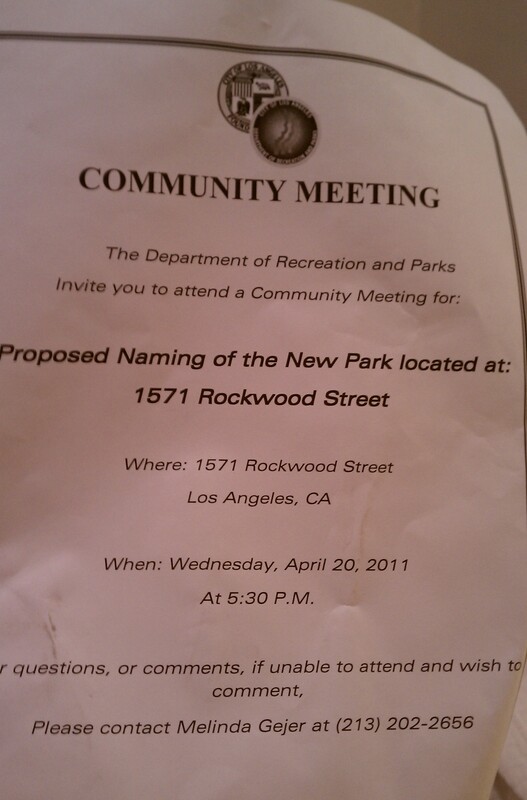 A name will be be bestowed on the Echo Park pocket park sometime in June. If you’re interested in being on that list, or have recommendations, send me a note at jovelle@jovelle.com .